Pretty much all external components on SJ axles are interchangable i.e. Stub axles, hubs, swivels, seals, bearings, freewheeling hubs. Internal components differ between the 410/413 and Samurai axles i.e. diffs, axle shafts and CV's are not always interchangable. Front are 22spline and rears are 26spline. 413 and Samurai diffs are direct swaps Although some Samurai's built from 1990 onwards have a larger bolt spacing on the diff flanges. All LJs, SJs and Samurais have a 65mm spigot on the diff flanges and props. SJ410 & lj80 diffs are smaller than SJ413& Samurai diffs so you cannot swap them. 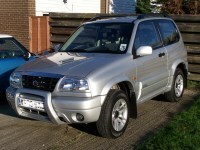 You can fit Vitara and early GV FRONT ring and pinions into 413 and samurai diffs, the available ratios are as follows. auto=4.6:1 or 4.3:1 depending on transmission. Front 22spline Vitara diffs are a direct bolt into Samurai/413 axles but if it is an alloy diff it is best to swap the ring and pinion into a steel Samurai/413 diff. Rear diffs are larger and do not fit Samurai/413 axles. Each front & rear perch needs to be moved 40mm inwards. if desperate could try a 50x68x7mm oil seal but it doesnt have the extra lip to keep the crap out. # 45623-80001] 4x Oil Seal Retainers. # [09285-00002] 2x Oil Seals. # [45600-82810] 2x Felts (come in pairs). # [45625-63001] 4x Oil Seal Covers. Last edited by Darrell on Fri Jun 15, 2012 6:32 pm, edited 1 time in total. 2005-GV 1600se, "Hell" What do I know! Nice one Darrel, if anyone was going to have something I thought it would be you. JUST BEEN ON THE PHONE TO SUZUKI AND THE PART CODE FOR THE CRUSH COLLAR (PART #5) IS NOW 27315-60A01 ON THEIR NEW PARTS SYSTEM. To the best of my knowledge all of the part numbers etc are correct. Complete Sj413 (not samurai) shafts and CVs can be swapped into 410 axles and vice versa; however the CVs and shafts will not work with each other i.e. a 410 CV will not fit a 413 shaft and vice versa. Another note is that early SJ410s and LJs were fitted with front drums. Never did get round to updating that corrupt diagram, so.